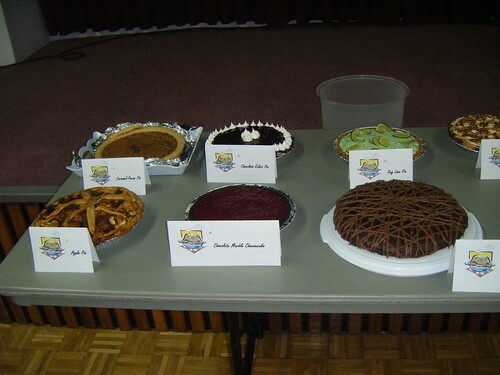 I won 4th place in the Thanksgiving Luncheon Pie Contest on Monday afternoon with this recipe. I also made this one and this one, both of which were popular but not winners. 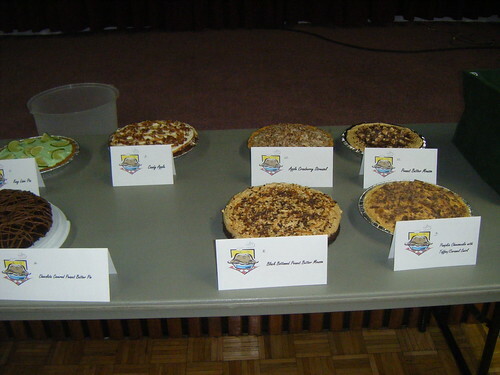 The other half of the pies. 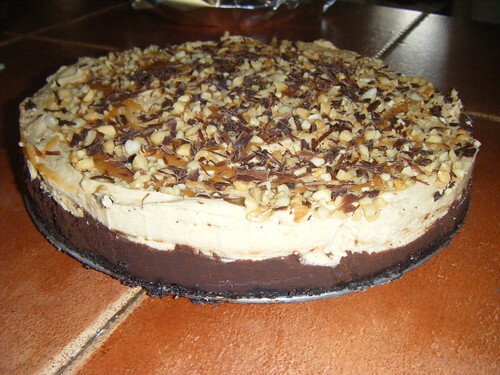 The Black Bottomed Peanut Butter Mousse Pie has to be one of my new favorite pie recipes. Even though it was about 3 steps too many for me, I will be making this again. But please, I implore you, when you make this bring a gallon of milk, you will need it to wash down the richness of this pie. 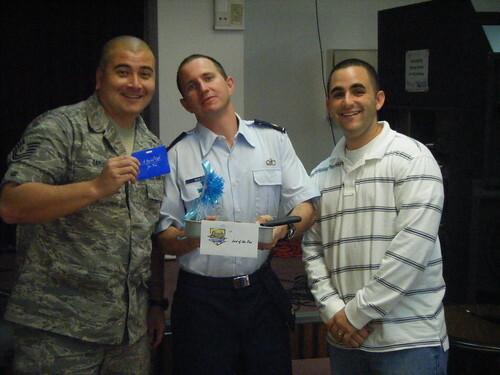 My goofy Hubby and 2 of his equally goofy friends also entered a pie into the contest, half in jest. They actually won first place, surprisingly enough. 3 of the 5 judges were men who were so excited to see Pizza Rolls used this way. I think the guys are going to send their recipe into Totino’s to be marketed on the back of the packaging. Hilarious! Joe and his friends, Brady and Joey – the brains behind “Lord of the Pies” a pie made entirely out of frozen Pizza Rolls. 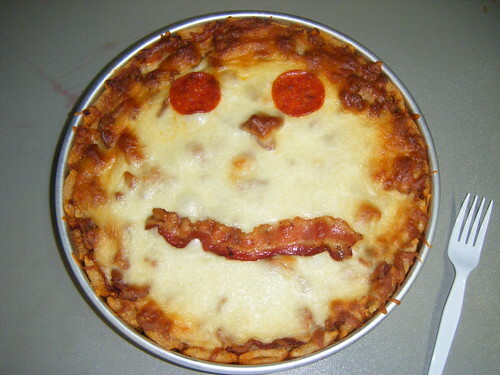 “Lord of the Pies” – complete with a pepperoni and bacon smiley face. Too funny! 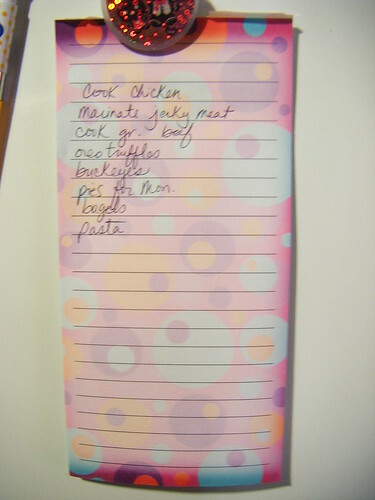 Finishing almost all the things on my “to-make” list before the baby comes. I need to make a few more dozen bagels because they came out sooo good and attempt to make some homemade pasta while I still have my friend’s stand mixer. I cannot bring myself to give this thing back. It’s a good thing she doesn’t need it for anything these days. I think I’ll make her some homemade bagels to thank her for lending it to me. The best pumpkin bread recipe ever. Thanks Amy! Seriously 4 days after making it, it’s still moist. I didn’t have quite a full can of pumpkin so I also used some pureed apple from my juicer and added chocolate chips. 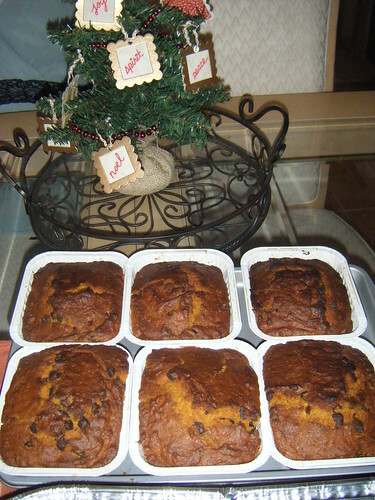 The recipe made 6 mini loaves for me. I’ve given 3 loaves away, we ate one and I have 2 loaves left that I have to give away or I WILL eat it. 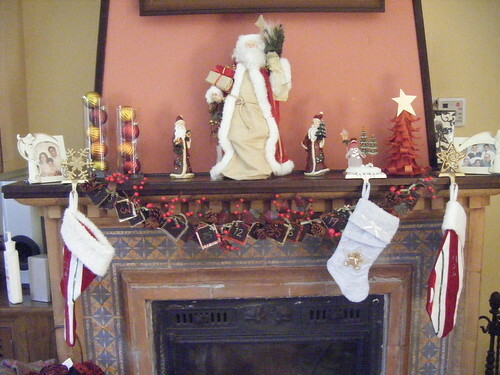 My finally finished Christmas mantel. I am very happy with how it came out this year. The glass balls in the tall vases and the Christmas quote advent garland (tutorial to come) are my favorite parts. Well, I am a little partial to the red curled paper Christmas tree as well. Ok, and the cute-as-a-button “My First Christmas” Stocking I found the other day for Tripp. I have been reading your blog for a while and I love it. You look so cute and all the pies look grate. I am from Estonia and our family blog is armsaimad.blogspot.com if you want to see how we look:) Mostly it is in estonian but my hubby promised to write some in english, since we have relatives in Hong Kong and America. Have a very happy christmas season!